TÍTULO : ¿Y TÚ, TE ATREVES A VIVIR TU PROPIA EXPERIENCIA? Si nunca lo intentas, ¡jamás sabrás que eres capaz, pero si te atreves y aplicas toda tu energía ... conseguirás esa vida soñada. Zambombás time has already started! 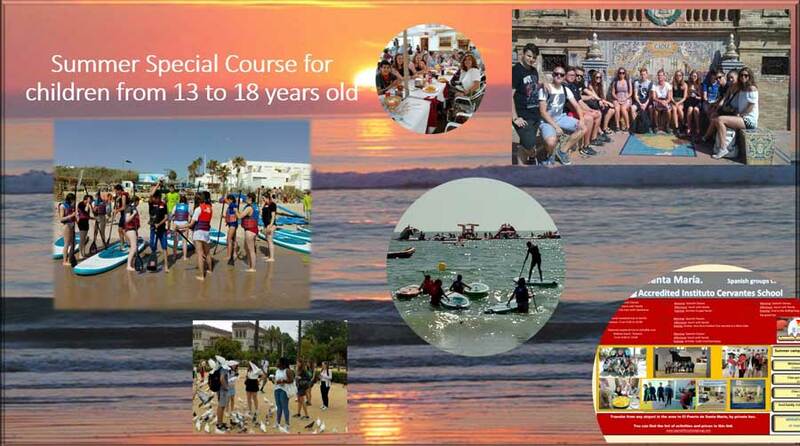 Do you want to Study Spanish in Spain? If you really want to master a language, there's no better way than to immerse yourself in it. Studies have shown that language immersion is extremely effective for students who wish to increase second-language fluency. All levels of students come out of even the shortest study-abroad immersion programs with an increased ability to speak and understand a second language. Other benefits of study-abroad language immersion programs include that students also gain a cultural education and that study-abroad language immersion programs prepare students for language exams such as the DELE exams from the Instituto Cervantes. Studying abroad is the best way to learn a language. Trinity Language School provides native Spanish teachers who can help you excel in mastering the Spanish language. Trinity has been a language school in El Puerto de Santa María with a strong heritage for over 25 years. El Puerto de Santa María is located just 10 kilometres south west of Cádiz, Andalusia, Spain . This area provides a rich culture for students to study and immerse themselves in. El Puerto de Santa María is full of monuments that are several hundred years old, such as the cathedral, the bullring, and Saint Marcos Castle.In the nearby city of Cádiz, you can visit a watchtower called Torre Tavira, which is the highest watchtower in the area and has a system of lents and mirrors thanks to which we can see a panoramic 360 degrees image of what is happening in that very moment on the Bay of Cádiz, projected on a concave horizontal screen. Studying abroad not only provides the most optimal setting for students to immerse themselves in a language, but also many other benefits. Studying abroad is a real opportunity for the students to travel and experience another culture and way of life that no other experience can provide. Short weekend outings and academic breaks allow students to explore the area where they're already living or take brief vacation travels. Studying abroad often takes place in a completely different continent, so that experience takes the students to places they would not otherwise have the opportunity to visit . Studying abroad makes students develop an understanding not just of a country's language and history but of its entire culture. Students are able to learn about every aspect of the country that differs from the student's home country, including the different eating habits and lifestyle of the people as well as how their core beliefs and values differ from those in the student's home country and why. Often the main beliefs of a particular culture's people stem from the region's topography and cultural and political history. Studying abroad helps students to expand their worldview and to open their minds.. Many college alumni who have studied abroad, including famous author John Irving, have stated that participating in a study abroad program significantly influenced their lives. The Institute for the International Education of Students published a survey of study-abroad program alumni. They found that nearly all alumni said that their experiences studying abroad influenced their later careers and choice of further education. The study also found that alumni of study-abroad programs said that their experiences also made them more culturally aware and that they made life-long friends during their study-abroad experience. Contact us today to learn more about our courses. Places fill fast! We cater to individuals and groups of all sizes. We're here to help you speak Spanish today.